This is the most balanced view of Turkey’s relations with the outside world I’ve seen recently. Finally the privileged states of Europe have realized that they need Turkey – and the best they can do is haggle over the size of the payment they will make to persuade Turkey’s government to stem the flood of refugees from the Middle East. At last Turkey has a powerful diplomatic card to play – and it was dealt to them by the West. 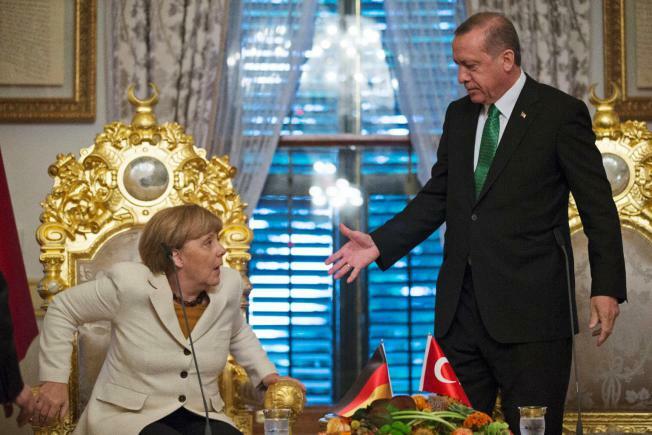 Turkey’s President Erdoğan offers his hand to Germany’s Merkel – who seems reluctant to take it. BRUSSELS (AP) ” Never waste a crisis, the political adage goes. The European Union and Turkey may be doing so right now, failing to build a closer partnership while facing a common challenge in the Syrian refugee crisis. Instead of bringing the two sides together, the past few weeks have mainly highlighted why the relationship has been troubled for decades. Even if the EU persuades Turkey to keep refugees from spilling into Europe ” in exchange for money and political sweeteners ” the deep-seated causes of the antagonism will remain. In recent days, Cyprus has thrown water on rekindled hopes for speeding up Turkey’s EU membership bid, and France and Holland stressed the need for stringent conditions before visa-free travel for Turks becomes a reality. An angered Turkish President Recep Tayyip Erdogan responded by accusing the EU of being “not sincere” about bringing Turkey into the European fold. Meanwhile, the two sides are bickering over how much money Turkey should get for helping to keep migrants out of Europe. The EU sees Turkey as a sieve letting through too many Syrian refugees, while Ankara says Europe is not doing its part in helping Turkey deal with the crisis ” and has always shown disdain for Turkey’s attempts to get closer to wealthy bloc. Even as relations soured, Erdogan has been able to bolster Turkey’s national pride, economic clout and strategic importance. The country no longer has much reason to be subservient to a troubled economic power like the EU. A glance at a map of the region drives home Turkey’s vital strategic importance as a bridge to Asia, and the volatile Middle East ” making it a key EU partner by force of geography alone. 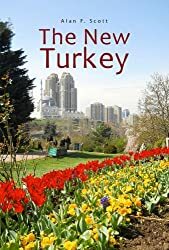 The conundrum is that Europe knows that it needs Turkey, but can’t seem to find a way to make the relationship work, especially with an increasingly assertive Erdogan. This entry was posted in European Union, International affairs, Middle East, refugees and tagged International affairs, Syrian refugees. Bookmark the permalink. I hate to say it but I’d surmise that the Europeans (as do I) view it in a similar way as parts of the of the world view the oil producing Arab nations – dealing with the ignorant yet powerful…who become even more powerful the less ignorant they get..! Not sure who are the most ignorant on this issue – but, yeh, I can’t see the EU admitting Turkey as a member this side of Doomsday. It’s never made sense to me that they don’t want to admit Turkey to the EU. It makes sense to them, though. They don’t want a Muslim country in their club, especially one whose population will probably overtake that of Germany in the next 20 years. Anyway, these days, you’d have to think being in the EU would be a mixed blessing.